Action Figure Insider • View topic - Anyone know where to get JLU Hal Jordan heads? Post subject: Re: Anyone know where to get JLU Hal Jordan heads? And yes, I own one and the Batman Beyond Stalker, too. Spy does first-class work. There's a Stalker, too?!? I was really disappointed that figure never came out. Is the head available cast from a prototype, and what body works best with it? Any other info (or pictures) will be greatly appreciated. Just PM SpyMagician. He sells an entire kit for the Stalker figure. he casts it in flesh tone brown and it's a cast of the entire figure. You just have to paint the details on yourself. It's a little pricey but it is great quality work. And Spy is an excellent person to do business with! It seems spymagician is no longer making Holiday Hal heads. Does anyone have a lead/suggestion about where else is a good place to acquire one? Really? Kinda surprised by that. Talk to Glassman. You can send him a PM over at Custom Justice. He's very good about answering and unless something has changed in the last month or so he still has them. You're more than welcome to contact him here too. I don't know that he checks over here as often though. So please don't think I'm JUST trying to drive you to CJ lol. Just wanted to chime in on this! Sadly I am no longer making the Hal Jordan castings. The molds I had finally wore out and I'm no longer able to cast at home and have to arrange off site studio time to do so. So for the foreseeable future I won't be able to offer Hal Jordan castings. I think it was great that you offered them up in the first place. I love mine. Thanks for coming here and updating us too. I recently recommended your Hal heads to someone over at Matty and I hope he was able to get one before the molds wore out because these were really phenomenal. Thanks again! I agree. I wish I had gotten few more from you now for some various Hal customs I always had planned but never did. At least I got the one that mattered. You mentioned "foreseeable future", so if this changes... Will you let us know? I always wanted to put your last Hal casting (the one with no collar) on the body of John Stewart's Power Ring, but it took me a while to find a spare body. And then you went on break. And I waited. And now it's too late. But if you ever come back... Please Let us Know!!! In the meantime... THANKS FOR EVERYTHING! Spy cannot be trusted. He is a sith lord! Just kidding he's awesome and works super fast. 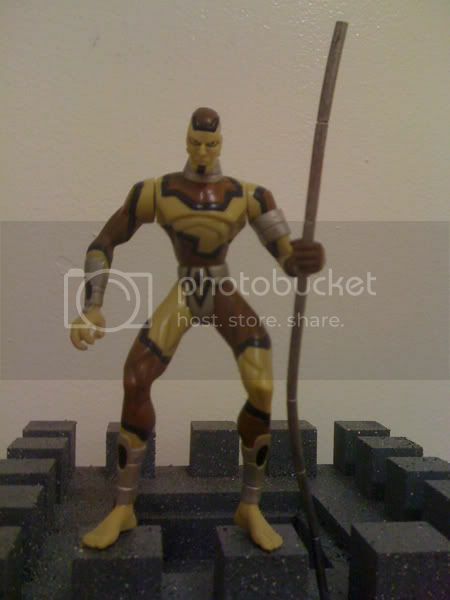 I also own one of the original Kenner/Hasbro Stalker test shots. I offered it on the swap meet board a while back or pretty cheap, but no takers.